Paid search campaigns (PPC) powered by transactional data attract more in-market buyers. Your PPC ads will stand out in searches with the highest visibility and relevance by showing payments, leases and prices. MPOP™ MPOP® campaigns update automotive offers automatically in real-time. No manual edits in Photoshop or waiting for updates from your current website provider. You are in charge of your marketing. Paid search ads should link to responsive dynamic landing pages with relevant content. When paid search ads are linked to relevant content, your cost per click (CPC) typically goes down while ad positions increase – making your dealership easier to find online. Many automotive marketing solutions don’t allow this level of control, transparency and relevance. Most are only designed to make an agency or vendor more money. 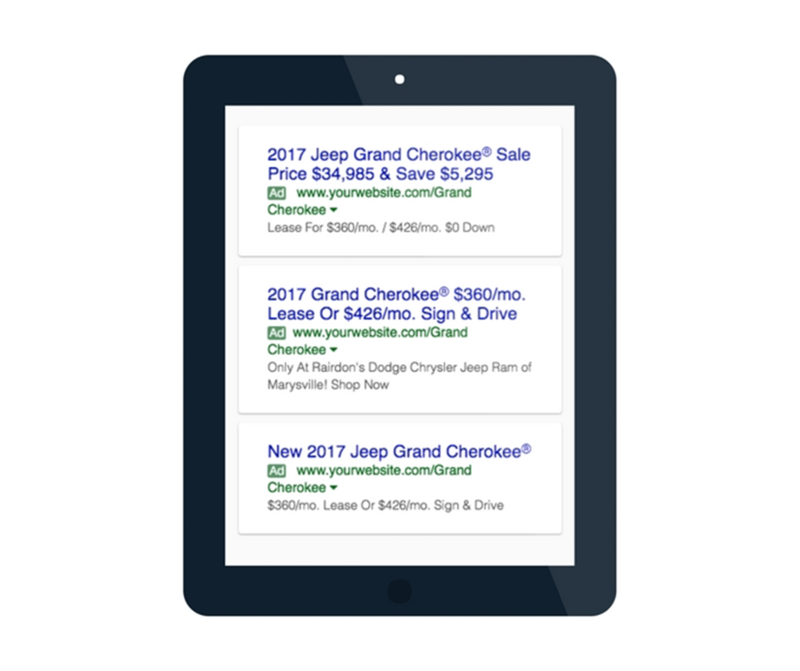 Dealer Teamwork’s MPOP SEM builds over 180+ Dynamic Ads in Google Ads accounts organized to help attract more car shoppers. Campaigns feature customized grouping and optimization designed by car dealers based on years of experience and tinkering. Effective and relevant paid search campaigns can significantly improve your dealership’s performance. Create, distribute and manage paid search campaigns with Expanded Text Ads that deliver more context and generate more clicks from qualified car buyers. Deliver up to 184 model-specific ads in each campaign and increase opportunities to answer shoppers’ questions while driving quality traffic to your website..